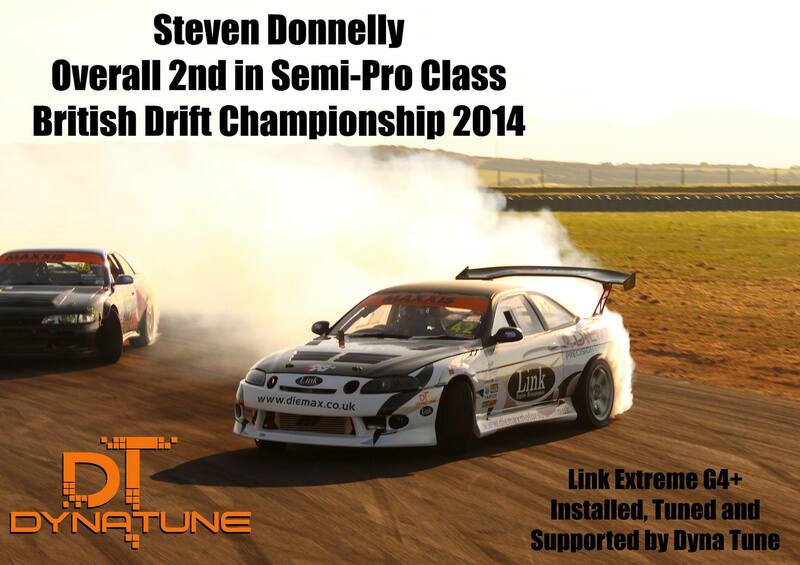 If you have been following our social media I’m sure you’ll have been aware that we support track side one of the drivers in the British Drift Championship. 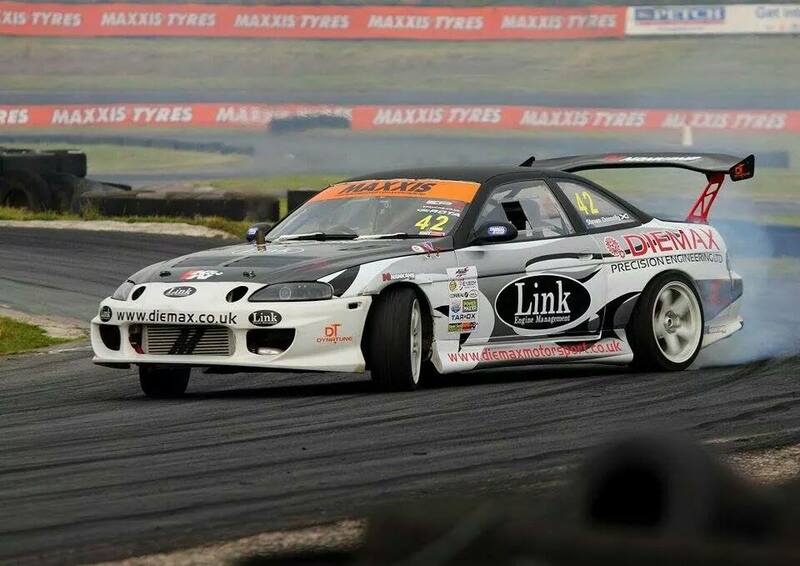 Steven Donnelly of Diemax Motorpsort is a Semi-Pro driver in the current class structure, driving a Toyota Soarer which began life as a standard road car. After a year of competing the team soon realised that the power to weight ratio for the car was needing addressed and that the Apexi Power FC was no longer the ECU for the job. 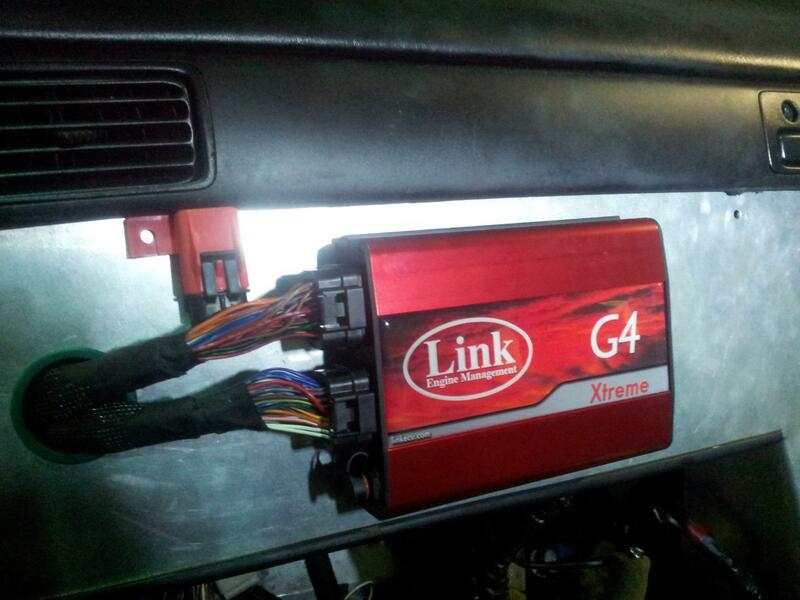 At this point they began looking for a more modern ECU that could take them to the next level, this is when they found the Link G4 Xtreme and also myself (although I was in the employment of another company at the time). The company I was working for agreed a sponsorship deal and the work began. The team had decided that they didn’t wan to risk the strength of the car so to improve the power to weight ratio the car needed more power. With the new ECU able to give more control the mechanical work got under way, the head was removed to install a multi-layer steel head gasket and ARP head studs, which will allow us to turn up the boost safely. A larger inlet manifold, injectors and throttle body was also installed meaning the fuse box had to be re-located inside the drivers cabin. 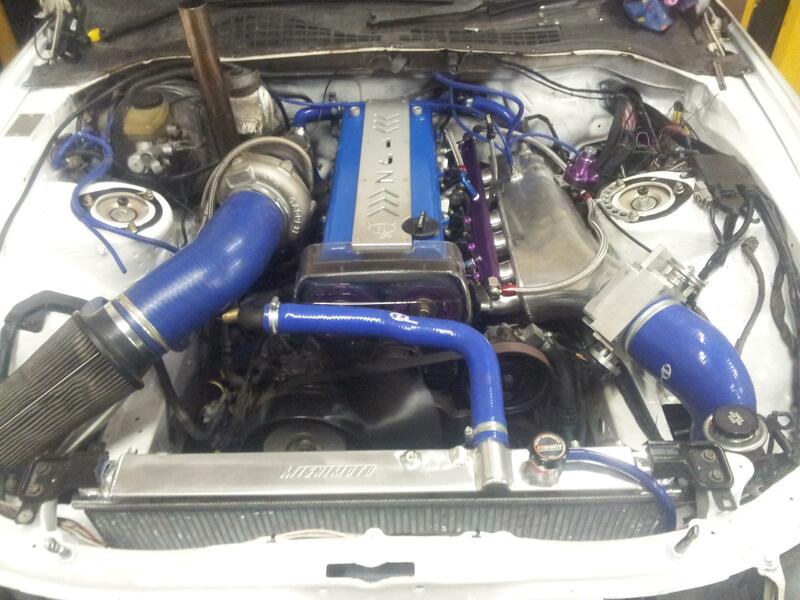 Once the ECU was finally installed it was time to turn up the power! The 2013 season kicked off and the car went from strength to strength as did it’s driver, with the car and driver gelling properly by the end of the season we had to once again raise the bar for 2014. The off season work mainly consisted of making the car lighter and giving the Link ECU more control of the engine. Diemax Motorpsort set about making the car lighter and as Dyna Tune had now been formed I began work to make a new engine loom for the G4 Extreme. After the grinding dust had settled and smoke had cleared the car was now well over 100 kgs lighter, the ECU now had control over all essential systems allowing safety systems to be implemented as required should something happen on track. The car was once again back on the dyno to make sure everything was as it should be for the season beginning and made an extra 50bhp pushing it well over the 500bhp mark now. Round 1 was at Lydden Hill and the car, which had been increasingly difficult to start, decided it didn’t want to start at all! with a bit of frantic work, clean spark plugs the car was up and running and Steven finished 5th! As soon as the car was up the road it was time to find the issue, a wet and dry compression test was performed telling us that the piston rings were worn, not too bad for a 100k mile engine which had already done 2 seasons of rev limit living. A replacement engine was sourced and fitted, tested then it was onto round 2. Round 2 was at Knockhill Racing Circuit, our home track, Steven qualified 3rd but the car developed a power steering issue, after more frantic track side repairs the problem was fixed, or so we thought, onto the battles and Steven lost the assistance of the power steering mid-drift giving the advantage away to the other driver meaning he finished 10th. Both his and the teams performance impressed the business development manager of Electronz, parent company to Link ECU’s who gifted a brand new Link G4+ Xtreme, Link digital dash and 4bar pressure sensor to the team. In between rounds Steven and the team attended the Extreme Torque Show at the Nissan Factory, Sunderland and the UK Round of the King of Europe (finishing 9th!) at Lydden Hill Race Circuit, were both he and the car performed at their best. 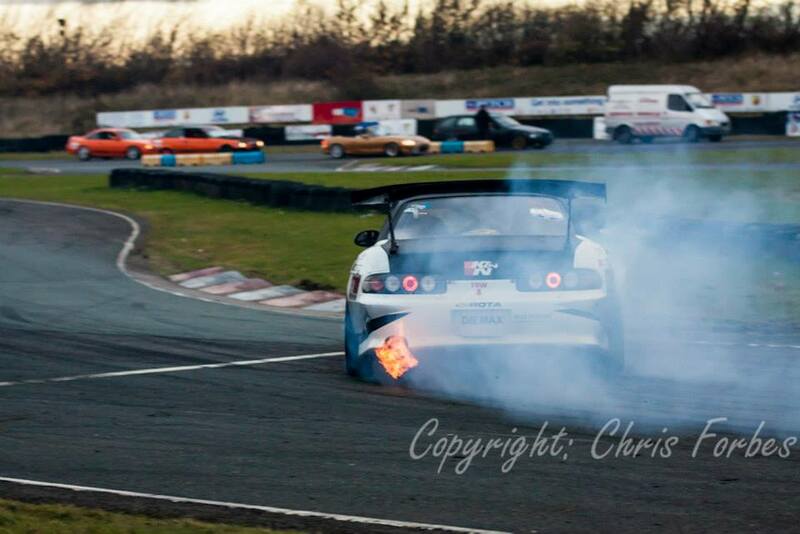 Round 3 was at Teeside Autodrome, Steven’s favourite track for drifting, with it’s high speed entry and long sweeping first corner the soarer sails round before having to slow for the tight middle section. The car now has a modified power steering set-up and couldn’t have been running better. With practise and qualifications on the Saturday the car developed another power steering issue, a new pump was sourced but before it could be fitted it cleared itself allowing Steven to qualify in 6th place after only drifting the first two sections lifting off for the third after thinking he’d developed clutch slip. After qualification the improved data logging on the new G4+ Extreme allowed us to see that Steven hadn’t experienced clutch slip, instead he had hit the power band right at peak torque causing massive wheel spin instead. With total confidence in the car going into battles on the Sunday Steven managed to bring home his first piece of silverware in the form of a first place finish! Round 4 was back down at Lydden hill but with a difference, they had decided to run the track backwards, a level playing field for everyone as nobody had ever drifted the track backwards before. Practice went well and Steven had managed to nail the line required, onto qualifications and disaster strikes during his first run, third gear in his R154 gearbox blew leaving him without his main drifting gear. He went out and tried to qualify just using second gear as we could get a new box that afternoon, he placed 32nd. Unfortunately due to time constraints placed on Lydden Hill from the local council the BDC can only run a top 16 instead of the usual top 32 leaving us out of the competition for the round. On to round 5 (round 6 for the super pro’s) Electronz have stepped in and provided a brand new, still in it’s wrapper, V161 6 speed gearbox from a Toyota Supra. Round 5 was held at Anglesey Circuit (Trac Mon in local tongue), Wales. Practise was filled with more frantic action as the ignition system had reached breaking point and caused a misfire on track leaving Steven with very little practise of this brand new track, with it all sorted in time for qualification Steven managed to qualify 20th in the top 32. After winning his first two battles Steven was put out in the ‘great eight’ finishing in 8th position, giving him enough points to hold onto second place in the whole championship.